NAFSA believes international education leads to a better, more peaceful world. The following reports provide members, our partners, and public officials with professional, timely resources needed to address the challenges facing international education in the 21st century. In October 2018, NAFSA convened a Global Workforce Development Roundtable on the “Role of Community Colleges in Global Workforce Development.” NAFSA brought together experts and leaders in higher education, community colleges, business, and policy for a discussion on Capitol Hill to examine the specific role that community colleges play in preparing their students for the global workforce. 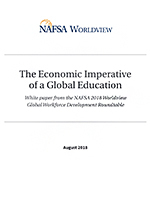 In April 2018, NAFSA convened a Worldview Global Workforce Development Roundtable on the “Economic Imperative of a Global Education.” Partnering with the Business Council for International Understanding (BCIU) and working with Senator Roger Wicker (R-Miss.) to host the discussion on Capitol Hill, NAFSA brought together experts and leaders in higher education, business, and policy to examine the connection between international education and global workforce development. 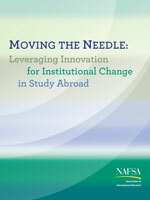 This follow-up study to the 2016 Moving the Needle report examined the impact of certain study abroad grant programs on the higher education institutions that applied for and received funding. 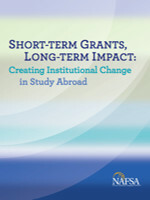 Short-Term Grants, Long-Term Impact confirms the original study’s findings that even the relatively small, one-time grants awarded through these programs can help encourage an institution to make a more long-term, sustainable investment in study abroad. In order to increase study abroad, a new national study abroad program primarily targeting higher education institutions rather than individual students was necessary. Three specific study abroad grant programs - 100,000 Strong in the Americas, US-China Student Exchange Leaders, and the Partnership for Innovation and Collaboration on Study Abroad - were examined and found to be an effective and efficient method of increasing study abroad. Together, U.S. visa and immigration policies determine who comes to our door and what type of reception they receive. This report provides policy recommendations that reflect the opportunities and realities of global academic and professional mobility that will be integral to the long-term well-being and security of the country. The United States faces growing global competition for talent. In order for the country to remain the preeminent destination for international students and scholars, This report urges renewed U.S.commitment to attracting the world's best and brightest. Former U.S. Defense Secretary William J. Perry served as honorary chair of NAFSA's Strategic Task Force on International Student Access. The group found that providing international students with educational opportunities in the United States builds and strengthens understanding and diplomacy around the globe, leading to a more peaceful, secure world. 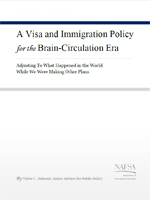 Based on the vision of the late-Senator Paul Simon, this Congressionally-appointed commission examined the concept of dramatically increasing the number and diversity of Americans studying abroad. The report outlines the current study abroad environment, challenges to Senator Simon's dream of "millions of American undergraduates studying abroad and carrying the name and values of Abraham Lincoln with them," along with the recommendations to achieving it. 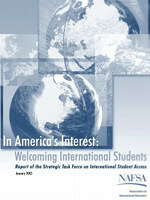 This report is the basis for what would become the Senator Paul Simon Study Abroad Act. 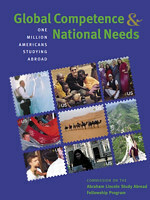 Americans' lack of knowledge of the world represents a "national liability," according to this report by NAFSA’s Strategic Task Force on Education Abroad, co-chaired by former U.S. Education Secretary Richard Riley and former U.S. Senator Paul Simon. The report outlines recommendations to federal and state governments, higher education institutions, and the private sector for dramatically increasing U.S. participation in study abroad.